A series of high profile cases have turned a spotlight on poor practice in the NHS, and in particular on an apparent lack of compassion among the very people who we rely on to care for us when we are most vulnerable. For Prof. Lesley Baillie, Florence Nightingale Foundation Chair of Clinical Nursing Practice, the reality is "inevitably" somewhat more complex and nuanced than the media coverage might suggest. Prof. Baillie believes that to find the root causes of the failings highlighted in these and other cases, we need to go back to the 1990s, when healthcare first became predominantly target-driven. "Success increasingly came to be based on what could be measured," she says. "That led to a distortion of priorities, and less attention being given to non-targeted activities. The patient experience got pushed down the agenda." Subsequently, employees were made to feel that they had no choice but to compromise on patient care. "If a ward is understaffed, you don’t have the resources to be able to deal properly with everyone that’s in need, and your manager is putting pressure on you to discharge three patients in the next 30 minutes to free up beds, you might well choose to focus on what’s achievable." It’s not a question of staff not wanting to care - the nurses at Mid-Staffs did try to speak out. This is a wider crisis in healthcare and one that requires a similarly wide-ranging solution. The initial NHS response came in the form of Compassion in Practice, a strategy and vision for all nursing, midwifery and care staff in England launched in 2012. It included the 6Cs, a set of values intended to inform the behaviours and attitudes of staff. "The 6Cs cover Care, Courage, Communication, Commitment and Competence as well," says Prof. Baillie. "But perhaps unsurprisingly the one everyone really focused on is Compassion. It’s also no coincidence that the strategy itself was named Compassion in Practice - there was a clear goal to restore the public’s confidence in the ability of the NHS to care for them and their loved ones." What Compassion in Practice did was clearly show that patient experience was now at the forefront of health strategy. As Prof. Baillie puts it: "It was no longer just nurses saying that care really should be delivered in a compassionate way, and that patients deserved to be treated with respect." Now, four years on, there has been a significant shift for teaching organisations – including LSBU. While the curriculum here has always emphasised the importance of dignity and compassion, at the same time as imparting technical knowledge and skills, there is now more focus on recruiting students who can demonstrate the right values from the start. 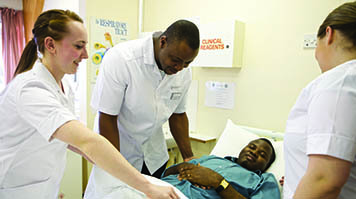 "Values-based recruitment is about ensuring we take on students whose values and behaviours align with those set out in the NHS Constitution," says Gary Francis, Associate Professor and School Lead for Practice Skills Learning and Simulation. I think the question of whether you can teach compassion is a moot point, but you can certainly make people more aware of the elements that go to make up quality care. LSBU has played a key role in the debates leading up to the launch of the strategy that will replace Compassion in Practice from spring 2016, provisionally entitled Our Vision. For Prof. Baillie, implementation will be key. "To succeed, the strategy must be based on evidence and build in robust mechanisms for assessing progress and measuring success," she says. "The consultation, including the debates held at LSBU in 2015, has gone a long way to ensuring that the profession feels a sense of engagement and ownership. That’s a good start." Nursing staff, alumni and affiliates of LSBU share their own experiences and views on the pursuit of a strategy championing compassion in healthcare. Paula is a matron at the University College Hospital NHS Foundation Trust, and wrote her LSBU Masters dissertation on the use of metrics in measuring nursing care. "It’s not easy to measure quality of care but there are indicators that, taken collectively, can give us some useful insights. These include workforce indicators, such as absenteeism and use of agency staff, so-called processes of care – which include non-technical aspects of care like educating patients about their condition and discharge planning – and of course patient experience itself. "I recently gave a talk at a local community college. The students asked me which of the 6Cs I thought was most important, and I said “care”. It covers everything: if patients feel cared for, it means they’ve had good communication from competent nurses with the courage and commitment to demonstrate compassion. We need to know more about what “care” actually means to patients, and that means looking beyond the existing “friends and family” test to really understand the factors that influence patient experience and start identifying themes and trends that we can then use as a basis for action. "As a matron, I rely very heavily on what patients tell me about the care they receive. Each month I read every single free text comment so that I can pick up any recurring themes. For example, we recently changed our admissions process after a number of patients told us they were finding it stressful. We developed the new approach as a team, and although there was some resistance to change from our medical colleagues we were able to ensure that the patient perspective prevailed. If a patient praises a specific member of staff, I make sure they get a personal “well done” from me. "For me, staff experience is also vital. It’s often viewed separately from patient experience, but I see the two as going hand in hand. Care for staff, and they will care for patients. Organisations can support that, by focusing more explicitly on the patient experience. I would urge them to look at their mission statements and rather than focusing on technical excellence, world-class education and research, think about going back to the heart of what the NHS is about – caring for those in need." Dr Louise Terry is a Reader in Law and Ethics within the Adult Nursing and Midwifery team. She is leading an international research team in exploring how perceptions of compassionate care are shaped by books, articles, poetry, theatre and film. "The NHS was set up to provide all people in need with healthcare, free at the point of delivery. But the NHS took over hospitals that had been a mix of private and charitable foundations and even former workhouses. Buried away somewhere deep in our minds, I think there is still a distinction between those who are deserving and those who are not. Coupled with that, the NHS is very politically influenced. Our project also covers Ireland, which is still a predominantly Roman Catholic country, and Canada, which also has a socialised healthcare model but with much less government direction. It will be interesting to see what comparisons that throws up. "Currently, the team is working on two papers. The first focuses on how nurse educators understand care and compassion. One idea we’re exploring is the link between compassion and abandonment – an issue that cropped up in 23 of the narratives identified by our sample groups. Another common theme is invisibility, and the difficulty of really seeing the person suffering. We’re also looking at so-called ‘muscular’ compassion – the idea that only the deserving should be treated with compassion. The second paper will look at how narratives can be used to educate and raise awareness. "The research has identified a wide range of thought-provoking examples, both positive and negative. In A Little Princess by Frances Hodgson Burnett, a little girl called Sara Crewe sees an Indian servant with a monkey at a neighbour’s house. He looks ‘sorrowful and homesick’ and so she smiles at him as ‘she had learned to know how comforting a smile, even from a stranger, may be’. "In Anthony Minghella’s film of The English Patient, the horribly disfigured patient asks the nurse for water. As she gives it to him, she smiles and makes eye contact. There is no revulsion at his appearance, merely kindness and compassion. "But for me, the most powerful example comes from Havi Carel, a philosophy lecturer who wrote her book Illness after being diagnosed with incurable lung disease. In it she writes how ‘the ill person may be reduced to her illness ... Nothing frightens me more than being ‘the woman with the oxygen’, memorable for her deficiency.’ The thing that sounds the simplest – to see the person, not the condition – may be the hardest of all to get right." Louise Terry will present her research on ethics and compassion on 22 June. If ever proof was needed of the power of social media to change attitudes and behaviour, look no further than Dr Kate Granger’s #HelloMyNameIs campaign, which started by her own admission ‘on the back of an envelope’. Consultant geriatrician Kate was diagnosed with soft tissue sarcoma, a rare form of cancer, in 2011, aged just 29. “When I was told that my cancer was terminal, the doctor could barely look at me,” she recalls. "He couldn’t get out of the room fast enough. And he wasn’t the only one. I was ranting to my husband Chris one evening about how few of the people looking after me actually introduced themselves and he said, ‘Well, why don’t you do something about it then?’ We registered the hashtag the same night." As a doctor herself, Kate is uniquely placed to understand the pressures staff face. "I don’t blame that doctor," she says, "nor the one who gave me my prognosis. They just didn’t know any better. There are so few resources and so many targets that it’s easy to lose sight of what matters. It’s draining too – every person you deal with needs you to give a bit of yourself. But making that connection, is so, so important. For a patient, it makes all the difference in the world." Since then, #HelloMyNameIs has had over 1 billion Twitter impressions. More than 400,000 doctors, nurses, therapists, receptionists and porters in 112 organisations in the UK have pledged their support, and the campaign has reached as far as the US and Australia. In summer 2015 Kate and Chris took the campaign on tour, visiting 16 different healthcare organisations around the country and reaching more than 2000 people. Kate goes out to universities to speak to students, has the ear of politicians and recently appeared on Radio 4’s Woman’s Hour as part of a discussion about terminal illness and death. In 2014, the NHS launched the Kate Granger Awards, to recognise individuals and teams who are making a positive difference to patient care. "It’s about celebrating compassion," says Kate. "There are so many awards out there that are focused on patient outcomes – all the things you can measure – but not about the things that make our job so special and unique. These awards are my legacy. It means I can die knowing that I’ve left my mark." But the story is far from over. Kate continues to lobby, to write, to travel the world publicising #HelloMyNameIs and, of course, to tick more things off that bucket list. And the campaign itself continues to go from strength to strength. "I think the reason why it’s struck a chord is that it’s universal, and it’s authentic," she says. "I had no strategy. I had a simple message, and a passionate voice. I really believe that if you get the basics right, all the other more complicated stuff just falls into place." Find out more about the campaign. Kate sadly passed away in July 2016. Find out more. Challenges - the most obvious being a lack of resources – still remain. However, many of those on the front line bring an optimistic perspective. "People talk about targets and compassionate care as if they are somehow mutually exclusive," says Caroline Spencer (Professional Doctorate in Nursing, 2014), a project nurse at Guy’s and St Thomas’ NHS Foundation Trust. "That’s not how I see it." "The most important thing is to care for patients as if they were part of your family. I believe that treating people the right way can actually save time by avoiding problems arising in the first place. With high quality care, many targets become achievable." As the Mid-Staffs inquiry report puts it, "...greater cohesion and unity of culture will not be brought about by further ‘top down’ pronouncements, but by engagement of every single person serving patients in contributing to a safer, committed, compassionate and caring service." Opinion: How will the Government's plan of axing nursing bursaries affect potential students?